Mr. Kafka is a K-12 Technology Integration Specialist that works with teachers and students to guide technology forward in education. iPad in the Classroom? Maybe. 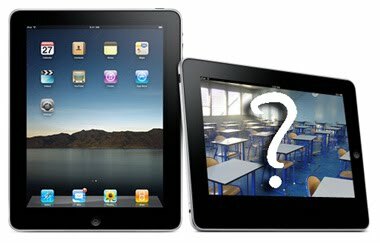 The question or topic I have been asked most often over the last week in relation to the iPad has been, "so are you going to get one?" My answer? No. Not yet. This tends to surprise people as I like technology and I personally enjoy finding out ways to use new technology, especially in the classroom with teachers and students. Here are a few of my initial thoughts about the iPad being used in the classroom. Functionality. My biggest setback (until someone makes an app for that) is...how do you get files off the iPad? Easily? If students were to create something (type a paper, create a presentation, etc), they would have to use the iWork suite which includes Pages and Keynote. These are not bad programs at all, but I haven't seen an easy way for students to save their files off the iPad. There's no USB drive where you could connect a flash drive. I've heard some say, "well, you can email the file off as an email attachment." That's good, but if using as a class set, do you set up an individual email address for each iPad? Some have said, "you could use a program like DropBox and set up the app on each iPad so they all connect to one account the teacher could get at for seeing student files. Maybe. I know the iPad can't be "networked" in a school building so that the iPad could see a central network or teacher folder. Hopefully this can be worked on. Efficiency. I like the iPad. I really do. You couldn't tear it out of my hands at the Best Buy demo table the other day (sorry to the guy waiting behind me huffing for a bit). In terms of efficiency, will this speed work up or slow work down? I didn't mind the touch keyboard on screen and found that it worked quite well, though I was not able to type as fast as I normally do on an actual keyboard. Some would say that the iPad is not supposed to be a "work computer" but I know I don't want to carry around a laptop and an iPad. Content. The apps so far for the iPad have really impressed me (Gizmodo's must have apps list). However, I think we are still a few months away from seeing apps that really make the iPad a "must have" as an all-in-one device. The iBook reader is great and I would definitely go for an iPad over a Kindle. I don't think any of these readers will ever "kill" books like many have predicted. I would love to see the iPad have all of a student's textbooks on the device so the student doesn't have to carry around so many books. I think this will open up reading for the younger generations and bridge a gap where kids will want to read so they can touch and use the technology. The Marvel Comics app came out of nowhere and I've been playing with it on my iTouch and really like how smooth and inviting it is. I am excited to see some educational apps or tools that come out in the next year to really make this an "in the classroom" device. Google Docs. My biggest disappoint right now as I write this is that I can't use Google Docs on the iPad. Google Docs, Spreadsheet and Presentation is free software from Google online and all you need to use it is a free Google Account. I have been using Google Docs more and more recently to keep my files online so I can get to them from anywhere. I'm sure Google is working on a way for this to be possible and there are rumors about Google making a "pad" of their own. Other Drawbacks? Here are a few other things I've been thinking about as possible hurdles to using the iPad in the classroom. I've read you can't print from the iPad (yet...someone will probably create a work around or app). The iPad doesn't have a camera (I personally don't see this as a big drawback like some do). Supposedly you can't multi-task between 2 apps or programs at the same time (I'm sure this will change in the future and Apple is announcing the fourth version of the iPhone later this week so maybe this new version will contain some multitasking capabilities that will find their way on to the iPad). Is the iPad supposed to replace the laptop? I don't think so, yet. Is it worth it enough if the iPad just replaces all the textbooks a student has to carry around? Maybe. Would kids love it if a teacher walked in with 30 iPads and they got to use them in class? You bet. But, how do we use them is the bigger question. There are a few logistics to still figure out so that the teachers and students using the devices are able to do so in a successful and meaningful way.